Hundreds of thousands of ecstatic French fans celebrated the return of their World Cup winning football team on Monday, jumping and chanting "We Are The Champions" as their bus paraded down the Champs Elysees before a special presidential reception. "Les Bleus", a dynamic, young team that won an open, fast-paced final 4-2 with Croatia in Moscow, appeared at the Elysee palace, where they burst into a spontaneous rendition of the "La Marseillaise" national anthem with President Emmanuel Macron and his wife. "Thank you for having made us proud," Macron told the players in the presidential palace's gardens. "Never forget where you come from: all the clubs across France that trained you." French media spent the day lauding the team's accomplishments. More than 300,000 people filled the Champs Elysees, the area around the Arc de Triomphe and the Place de la Concorde on Sunday night, partying into the early hours, singing the Marseillaise, setting off firecrackers and blaring horns until the sun rose. 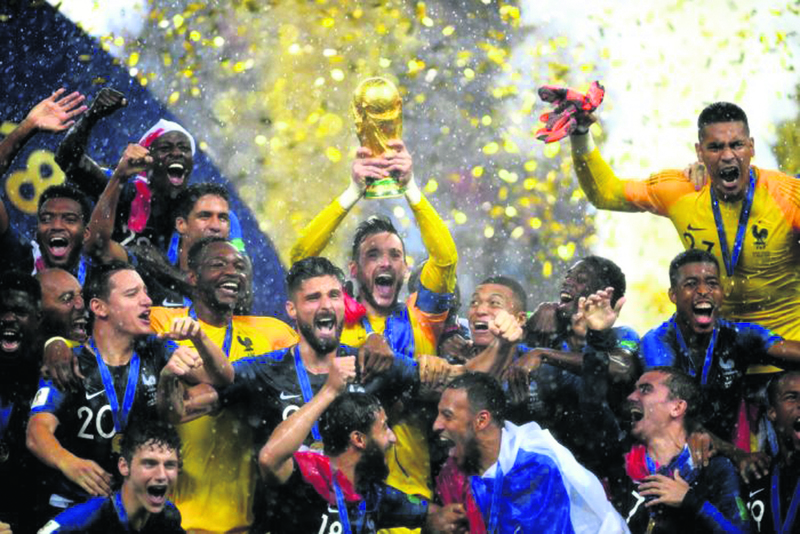 France won the World Cup for the second time by ending battling Croatia's dream of a first title with a 4-2 victory on Sunday in one of the most entertaining and action-packed finals for decades. France led 2-1 at half-time after a Mario Mandzukic own goal and an Antoine Griezmann VAR penalty, with Ivan Perisic briefly bringing first-time finalists Croatia level. After that, Paul Pogba and Kylian Mbappe found the back of the net past Danijel Subasic to put the game beyond Croatia. Mario Mandzukic did score a second for Croatia but they could not do much more. In a stadium packed with presidents watching the World Cup final, no one had as much fun as Macron. The French head of state joined his country’s victorious players in the locker room after they beat Croatia 4-2. He jostled with midfielder Paul Pogba while being filmed for Snapchat. And he posed for picture doing a dab pose with defender Benjamin Mendy. After the game, Macron offered up a flurry of kisses in the exuberant, rain-soaked celebrations. He kissed Croatian President Kolinda Grabar-Kitarovic on both cheeks. He kissed France teammates Kylian Mbappe and Antoine Griezmann on their foreheads. Macron seemed to be so happy that he was unconcerned about being caught in a torrential downpour on the field at the awards ceremony.